According to the CDC, about 15 percent of adults in the United States are smokers. However, smoking rates are significantly higher among people who are also struggling with drug and alcohol addiction. If you’re considering seeking treatment, you may find yourself wondering if it’s best to quit smoking while you’re in rehab or if you should concentrate on beating one addiction at a time. The answer to this question depends on several different factors, including your own personal recovery preference. Long term tobacco use can cause a wide range of health problems, including emphysema, chronic bronchitis, and heart disease. However, the health benefits of quitting smoking can be seen almost immediately. For example, your heart rate and blood pressure will be back to normal within two hours. Within two to three weeks, your blood circulation and lung function should improve enough that exercising or engaging in physically strenuous activity will be noticeably easier. The traditional thinking was that quitting smoking could threaten sobriety by increasing the intensity of a recovering substance abuser’s cravings for drugs and alcohol. Today, we know this is simply not true. Quitting smoking will not threaten your recovery and may even be beneficial if you’re suffering from alcoholism and strongly associate drinking with smoking cigarettes. Since nicotine is an addictive substance, the process of quitting smoking is much like conquering alcohol or drug addiction. Use of nicotine replacement therapy via patch, gum, inhaler, or nasal spray can help keep your nicotine cravings under control. The same coping techniques you learn in recovery to handle cravings for drugs or alcohol can also be used to manage nicotine withdrawal. For many people, smoking cigarettes is seen as a way to cope with stress. While it’s true that the experience of getting sober can be stressful, this doesn’t mean that you can’t quit smoking if you wish to do so. To some extent, stress will always be a part of your life. Even when you’re sober, you’ll be dealing with stress in your relationships with family, friends, and co-workers or supervisors. Quitting smoking while in rehab may give you a chance to come up with healthier ways to handle stressful feelings, such as meditation, deep breathing, yoga, listening to music, or writing about your feelings in a journal. This experience will leave you feeling more confident and in control of your sobriety after your time at the treatment center has passed. Nicotine acts as an appetite suppressant, which is why fear of gaining weight is common among people who are interested in quitting smoking. However, this fear is misguided. The vast majority of people who quit smoking gain no more than five to 10 pounds. If you’re currently malnourished due to your drug or alcohol addiction, gaining a small amount of weight may be beneficial. If you are already at the right weight for your frame, making a point to exercise regularly and avoid overindulging in sweets or processed foods can help prevent any weight gain related to quitting smoking. Experts agree that fear of weight gain shouldn’t be a deciding factor in whether or not you attempt to quit smoking while in recovery. If you’ve tried to quit smoking unsuccessfully in the past, you may think it’s not worth the effort to try again. However, quitting smoking is often a process that requires several attempts to be successful. A study recently published in BMJ Open suggests that it can take up to 30 attempts for smokers to go for one full year without cigarettes. Often, what works best is when a smoker has a powerful and personal reason to want to quit. Seeking treatment for your alcohol or drug addiction and making the decision to begin a fresh chapter in your life may be the mental “push” you need to kick the habit for good. There is no one size fits all treatment approach for addiction. 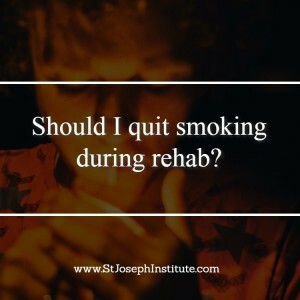 If you desire an opportunity to make a completely fresh start, St. Joseph Institute can help you quit smoking at the same time you address your alcohol or drug addiction. However, if you would prefer to focus on overcoming one addiction at a time, our counselors can help you develop a treatment plan that works for your unique needs.